After the initial “wtf?! are my eyes deceiving me?” moment has passed, you inevitably re-loop back into the same question because of how little sense this makes. The best case scenario has everyone leaving with a bow in their hair and worst case is that everyone leaving looks like this. Sure you should take your wife there are pay her for a hairdo with a Hello Kitty bow, like Lady Gaga had! In the meantime, you could have your hair cut to, wouldn’t that be great? An HK ladies’ hair salon – given that no man should ever enter a ladies’ hair salon in the first place, things could be much much worse! Wow, when I saw this I was like, Is this for real? Then again it is hello kitty. That is messed up, seriously. I have to wonder what is the average age of their clientele. Jesus h christ. Get out while you have some semblence of sanity left. Or sit your wife down and quietly explain its the marriage or the Cat. I fail to see the outrage, it just a salon. MR. HKH I am start tkinking you are exaggerating about your wife. I get my *hair cut at the Hello Kitty salon in your direction. * chances are nil because I bet they do not do or know how to do mens hair. I bet they overcharge on everything. I hope at they at least hired some decent hair stylists or you just overpaid for something you could have gotten for less then $20 at Wal-mart. You don’t understand women at all! Women want to look great and feel good about their looks. Hello Kitty always does this and going to a Hello Kitty hair salon will allow a woman to bring out all her inner beauty. That is what Hello Kitty does and why all women love her. Any person who had a chance to go here would and be so excited about it. I can’t believe you don’t want your wife to look beautiful. How completely selfish can you be? If she wants to go to a Hello Kitty hairdresser, then you should pay for her to do so. She is doing it for you and your lack of appreciation shows what a shallow man you are. If I ever get a haircut there, kill me with ANY HK gun to punish me if I didnt suicide already, my hair is my life. In that case.. Cut my hair off with Hello Kitty scissors(spelled right? xD) and tattoo Hello Kitty on my head as a punishment. Maybe after that, kill me with any Hello Kitty gun. I don’t even want to know how much it costs to just have simple things done to your hair there. Everyone knows HK is a little gold digger and would do anything to score a buck and help her take over this God forsaken world. I think I’d rather shave my head than get my hair styled here. But even then HK would probably try to do something to my bald head. And yes, I agree with Maaike. My hair is my life and I’d never let the claws of HK even touch it if I still have all of my brain chemicals balanced. For kids only? God I hope so. The barbershop where I take my son is decorated with Nascar everywhere, and caters mostly to boys and men. If this salon caters mostly to girls and women, I don’t see how it’s a very different concept from the Nascar barbershop. Darlene, will you marry me? darlene, i’m a woman. i’d rather be thought of as beautiful, attractive and/or mature than “cute”. hello kitty may be “cute”, but will never help a woman gain the real self-respect and confidence she needs as a woman and a functioning adult. By the way, does anyone else find that little HK figure with the bag and the outfit in front of the salon creepy? Eughh. wait, darlene, you said he should want his wife to look beautiful, then called him shallow for *not* wanting her to go to a salon that you claim will make her beautiful? make up your silly little mind: is he shallow or not? then again, do you know what shallow means? LOL. You beat me to the punch now we will have to duel for the honor. pistols at dawn or a coin flip? Going to a salon – for a lot of women, anyway – isn’t just about the end result, but the experience while you’re there. If the evil feline is what floats your boat, then looking at her while you’re getting your hair done makes you feel good even if it doesn’t make your hair look any better, and that’s part of what you pay for. My hairdresser could probably do just as good a job in a filthy bus-station rest room with a broken folding chair, but I wouldn’t feel as pretty as I do coming out of her well-decorated shop. Boys be warned marrying Darlene means you need to wear a Dear Daniel outfit for the rest of your life. Or an HK outfit. It gives me the creeps just thinking about it. I guess you are new and do not know me. I have a small hello kitty collection including 20 plushies, bedding and backpack. As a former hairstylist, I think this would get old fast unless you had a high tolerance for cute and pink ! 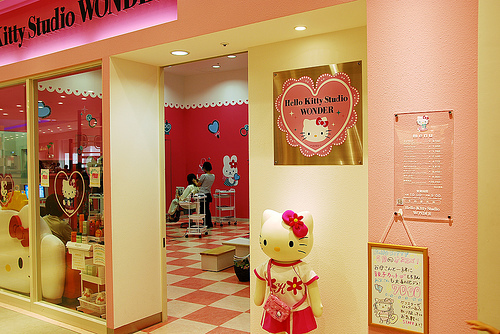 In the salon world, this is a business failure waiting to happen…only greedy Sanrio would make money in the end ! A haircut at Walmart ? No way, no how !!! You don’t understand human beings at all! .. And btw he didn’t mention anything about not wanting his wife to look good, did he? omg i would love to go and get my hair done there. its awsome! OMG That is the shizzzzzzzzzzzzzzzzzz!!!!!!!!!!!!!!!!!!!!!!!!!! I would love to hear your wifes side of the story. ooh! ooh! you could have hello kitty shaven into your hair!!!!! oh that would be so good! do that, take pictures, put them here and complain about it! 😀 please please! I saw a photo online of someone sporting a hello kitty hair tattoo before, and now I am wondering if this salon is cool enough to actually do it for their customers too, if they are, I am going for sure! “Welcome to Japan”. Somebody told me about these salons before but I’ve been spared the misfortune of having to see one personally :). Where do you find all of this stuff, lol.